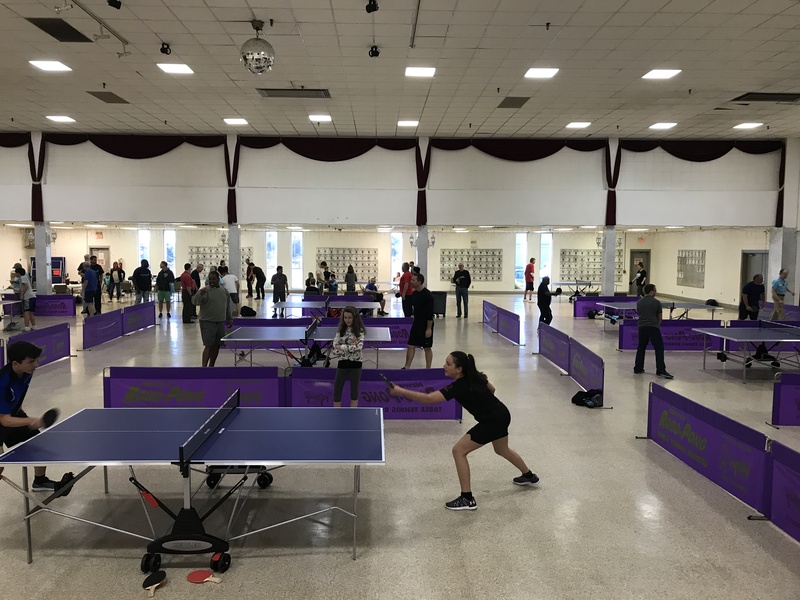 Ping-Pong Tournament: Remember a few weeks ago when Karren Pell informed us of an upcoming ping-pong tournament to benefit a local halfway house called Renascence? It was a brilliant idea, hitting that perfect sweet spot between “fun” and “good cause.” We immediately registered for the Saturday morning tournament, and we signed up for the Friday night “preview party” too. The social event was nice, with a well-appointed silent auction, beer and wine, and some food. Plus you got to warm up on the ping-pong tables. We played a little bit and even bid on a few auction items, which was fun. We won a hand-crafted spinning bookcase that (according to the attached material) once resided in the law offices of local legendary judge, Vanzetta McPherson. The next morning we were at the Alcazar Shrine just after nine to compete. They gave us shirts and pointed us toward the guy in charge of making brackets. One of us was registered in Beginner, the other in Intermediate. It seemed like things might be a little chaotic at the start, but their ability to run a tournament quickly clicked into place. There were a lot of people there, too – at least 50, plus some spectators. We didn’t do so well, though. One of the lessons that we learned is that there are people in Montgomery who are really good at ping-pong. Like they brought their own paddle, had coaches and matching shirts. We, who sort of never really practice, didn’t stand a chance. But it was really fun to play, and fun to be in a diverse room full of laughter and active tables. We had some family come up from Pike County for the tournament, so after we all got eliminated, we decided to go to lunch. Tofu Palace: We got Korean food, which is plentiful and delicious here in Montgomery. Our current favorite place to go is So Dong Gong Tofu & BBQ, out by the bowling alley on the Boulevard. The food continues to be great, with huge portions at reasonable prices. One of us had the tofu noodle soup with kimchi and the other a gigantic seafood pancake. We said almost everything we could about the food in our formal review of the place (which you can read here), but the quality remains excellent. Our family members enjoyed the experience, and we left full of rice and mushrooms and red chile paste, and quite happy. Brunch: We had meant to go to El Rey for the Pisces Brunch on Sunday, but when we drove by at 11 and saw the line, we decided to go in a different direction. Congrats to El Rey on their brunch crowd though. We’d been meaning to check out the brunch at Cork & Cleaver over on Zelda (it’s in the old Michael’s Table location), so we headed over there instead. Seating on the patio was plentiful, and service was quick and attentive. They have a “bottomless mimosa” option, but it wasn’t that kind of day. So we just had a Bloody Mary (for one of us) and a “red mimosa” for the other. The latter drink was very tart, and came with freshly muddled raspberries. We both had eggs Benedict with crab cakes – one of us with an English muffin underneath, the other with spinach in the Sardou preparation that Sinclair’s (RIP) made famous around here. The food was good, and the crisp and coherent crab cakes were a nice addition. After brunch, we were due to see some friends’ child perform in the Alabama Dance Theater’s matinee of “The Little Mermaid.” While we were lured in by the promise of being supportive, we actually enjoyed the show, which contained several sequences other than the familiar Hans Christian Anderson tale (and Disney film). The choreography from Sara Sanford, the resident choreographer at the Alabama Dance Theater, was especially effective, highlighted by a more modern piece wholly unrelated to the mermaid’s story. That segment, titled “Stardust,” contained audio samples of someone talking about the Hubble Telescope, and exploring both outer space as well as the physical space of the stage. Sanford also did the choreography for the “Little Mermaid” portion of the show, and several performances were excellent. Jonathan Chapman was good as The Prince, and the Sea Witch had real menace and grace. And we were super happy (and surprised) to see former Montgomery Biscuits hype man Mickey Lonsdale showing off some outstanding strength and agility. The dancer who played the titular Mermaid was also great. Kudos should also be directed at the folks who did the costumes and lighting, creating a colorful undersea environment with fabric waves and incandescent jellyfish. All in all, we’re lucky to have the Alabama Dance Theater and a great venue like the Alabama Theater downtown. It was a busy weekend, but one that reminded us of how much opportunity for entertainment is all around us.